There will be council elections in Wolverhampton and many parts of the UK on Thursday 2n May. The Registration Deadline for these Local elections was the 12th of April and more than 300,000 applications to register to vote were submitted in the final week. Nearly 125,000 were submitted on April 11 alone. The two-party system is falling apart. Why? Because the structures that underpin it remain stuck in the past. At its core, the Brexit chaos is the fallout of an impossible situation: where two parties try to represent the interests of all people, and can't. Brexit has opened up new divides in the political spectrum that the two main parties are struggling to bridge. Ahead of the May 2nd City Council elections, the Wolverhampton Electoral Office has set postal votes ballot papers to electors who request them. Liberal Democrat candidates have delivered letters to these electors. 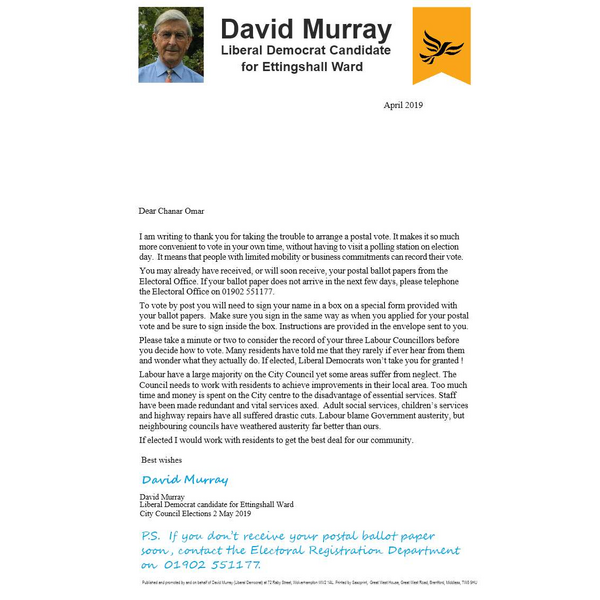 In Ettingshall, David Murray wrote, "Please take a minute or two to consider the record of your three Labour Councillors before you decide how to vote. Many residents have told me that they rarely if ever hear from them and wonder what they actually do. If elected, Liberal Democrats won't take you for granted !"